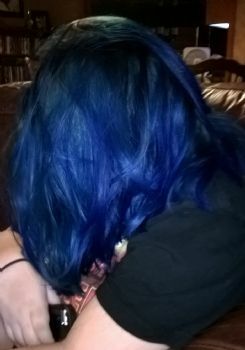 Ok, this is a daughter approved pic showing her gorgeous blue hair I told y'all we were going to have done! We did it! I don't think the pic does it justice. There are also shades of purple and a hint of greens in it as well as the couple shades of blue. I'm glad I let her go through with it, she loves it, too. I did buy her some shampoo and conditioner for colored hair, and also they told her to use cold water. I hope it lasts quite a while!! I love it!! So fun!! Absolutely BEAUTIFUL!!!! Don't let her was it for the weekend. Rinse in COLD water before shampoo and then rinse the conditioner out with cold. Trust me, those two things with shampoo designed for colored hair make a HUGE difference. This is such a gorgeous shade of blue! I love it! Hope it lasts for a really long time! My 14 year old daughter was nominated last year for being color coordinated. She matches her glasses to the color of her hair each year. It's awesome to let them explore. This is a very pretty blue. Thanks for sharing,teens will be teens and the fads. Gorgeous! My daughter had pink put in her hair the first of the month. It was a wash out color so it didn't last long but was so pretty on her.